The Great Lakes Alberg Assoc. For annual lift outs on Alberg 30s the primary winch is just ahead of the rudder shoe. Somewhere about the forward lower shroud is a good place for the front sling. I have to dodge my knotmeter propeller and my depth guage transducer. The slings should be tied together with dock lines to prevent the forward one from slipping ahead . This can be done while in the water before the lift and use a boat hook to slide the dock line lower on the slings, particularly the forward one, although having the dock line parallel to the waterline is a good idea. The Alberg 30 hull is strong enough to lift the boat from further aft but you will have to manipulate the slings if they are on a spreader so that they lift evenly , ie. generally shorten the aft sling or lengthen the forward one and this takes about12 feet of sling adjustment with associated clevises. I use a 2" x 10" by 14 foot hickory plank that is not fixed to the trailer to support the keel so I am able to adjust it so that the aft belt below the hull is easily removed. It also helps if you are using a travel lift as opposed to a crane with one lift point and a spreader system. With the travel lift, the front and back sling can be moved independently so the angle of the slings can be changed with the aft a bit high to keep the forward one from slipping. Getting high enough for trailers though can be a problem if the aft belt is long enough that the system runs out of lift. 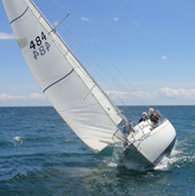 If you are dealing with other Albergs, particularly hulls built by Nye boat works like 22's or 29's, the lift has to be from the aft, behind the rudder because there are no bulkheads in the boat at the rudder shoe and the boat may crack because the hull is very thin from the ballast plug aft to the rudder. If one lifts from the ballast plug, the centre of gravity is so far ahead, that the load is unstable in the slings.